Philadelphia publisher Brian Tierney castigated his creditors a few weeks ago as he sought to fend off their efforts to take control of the newspapers he bought for too much money and then steered into bankruptcy. But the consequences were not nearly as calamitous as Tierney suggested when some of the same creditors took over the Minneapolis Star Tribune late last year. Though the outcome may vary in Philadelphia, the realities of the marketplace suggest Tierney’s concerns may prove to be unfounded. Tierney was outbid and effectively ousted as publisher yesterday when Philadelphia Newspapers LLC, the company that owns the Philadelphia Inquirer and Philadelphia Daily News, was purchased for $139 million by a group of creditors led by Angelo Gordon & Co., a New York-based fund that specializes in turning around distressed and out-of-favor assets. The auction culminated months of bitter feuding between Tierney and the creditors, who the publisher accused (video here) of not being committed to the best interests of the paper, its employees or the community. “It will break my heart if accidental owners take over who don't care,” he told Reuters on one occasion. Befitting his prior background as a successful public relations impresario, Tierney’s stewardship of the Philly papers was consistently passionate. But it wasn’t always selfless. While he was laying off staff and preparing to file for bankruptcy in 2008, he boosted his pay by 38% to $850,000 a year. Tierney subsequently rescinded the raise. The auction this week cleared the way to bring the papers out of Chapter 11, where they landed in February, 2009, after defaulting on the $412 million in debt that Tierney borrowed when he and his fellow investors inauspiciously overpaid for the properties as the newspaper business commenced its epic decline in 2006. The investors lost a total of $150 million in equity, including $10 million that Tierney contributed himself. If all goes according to plan, the Philly papers will have only about $40 million in debt when they exit bankruptcy at the end of June, taking enormous pressure off them to achieve hopelessly unachievable profit targets at a time of swiftly sinking advertising sales. But lower debt won’t relieve the papers from having to produce the exacting profit targets set by their new owners, who, like most financially oriented buyers, will be looking to groom the business for a profitable sale in not too many years. Only moments after the auction, Robert Hall, a former Inquirer publisher who advised the creditors and will become a top executive of the reconstituted company, told reporters that the new owners would demand concessions from unions to achieve what one insider said was $20 million in savings. For an approximation of what the future might hold under the new management, the Philly papers can look to the Star Tribune, which was brought out of bankruptcy at the end of last year by another group of creditors led by Angelo Gordon. While the new regime in Minneapolis has been in place only a few months, it got a cautiously positive review yesterday from media blogger David Brauer of MinnPost.Com. “If you took a poll, you would find that most people at the Star Tribune – except for the 100 or so who lost their jobs earlier this year – would favor the current ownership over what came before,” said Brauer, referring to Avista Capital Partners, the New York investment firm that bought and over-leveraged the papers in late 2006. But, he added, the company now is “bragging about improved cash flow” and has voluntarily reinstated matching grants for the 401(k) program, including a portion of the plan that requires the company to meet prescribed profit goals. Because the situations in Minneapolis and Philadelphia are not entirely comparable, the Minneapolis experience is instructive only to a degree. However, those who made it through the “purges” in Minneapolis are breathing cautious sighs of relief, said Brauer. Contrary to Tierney’s emotional warnings in the days leading to the dénouement, the reality is that newspapers will be influenced far more by the exigencies of the advertising business than the predilections of the particular entity that happens to own any one of them. For all the affection Tierney expressed for Philadelphia and its newspapers, he could not save them from bankruptcy when the economy collapsed. Had he won the auction and business soared, he could have claimed the credit and reaped the benefit. If he won the auction and business soured, he would have been stuck with the dirty work of cutting jobs, news hole and more. The new owners in Philly want to make the papers as successful as Tierney hoped they could be. But they also will do whatever it takes to protect their investment. As a rational businessman, Tierney would have done the same. As of the end of 2009, Kramer was about halfway to his goal of achieving philanthropic independence. Even if MinnPost makes it, Kramer won’t rule out taking charitable donations to pilot additional projects at an operation already providing thoughtful and high-caliber coverage of news, issues, politics and culture in the Twin Cities and beyond. Kramer’s quest for philanthropic independence is a matter of necessity, because MinnPost since 2007 has raised just $1.1 million in seed funding from multiple sources. Bequests range from $455,ooo from the Knight Foundation to a grant of $60,000 from a Minnesota foundation. :: Pro Publica has a cornerstone commitment of $10 million per year from a single benefactor for three years that is renewable at $10 million annually in subsequent years. Pro Publica, which recently earned its first Pulitzer Prize, got $1 million last year from the Knight Foundation just to look for more money. :: Texas Tribune was launched last year with a $5 million grubstake from a handful of wealthy patrons in the Lone Star State. Like MinnPost, Texas Trib hopes to diversify away from big-ticket grants. In the meantime, however, it is operating on a comfortable cushion. :: Bay Citizen got a $5 million jumpstart last year from San Francisco financier Warren Hellman. Even though the venture won’t publish its first story until May 26, Bay Citizen is in full fund-raising mode and recently leased stylish offices in downtown San Francisco. But things are different at MinnPost, where low overhead is a way of life. Although Kramer and his wife, Laurie, have worked tirelessly on the project since they launched it in 2007, neither ever has drawn a dime of pay. Their commitment, which includes personal donations in excess of $120,000, contrasts to the hefty six-figure salaries paid at Pro Publica, where editor Paul Steiger makes $570,000 per year; the Bay Citizen, where CEO Lisa Frazier earns $400,000 annually, and Texas Trib, where editor Evan Smith gets $315,000 a year. With an operating budget of $1.2 million in 2009, MinnPost employed a staff of 18 (including the unpaid Kramers) and four-dozen freelancers, according to its annual report. By contrast, the Pro Publica payroll in 2009 was budgeted at $9 million for a staff of 37, plus a few short-term interns and fellows. Setting aside freelancers in both cases, the average budget allocation per full-timer was $66,667 at MinnPost, which would include pay, benefits, office space, expenses and more. That compares with an the average of $243,243 allocated for each head at the New York-based Pro Publica. Subtract pay for freelancers at MinnPost and the average budget allocation for each full-time staffer drops at the Minnesota shop. Lacking a hefty endowment to underwrite its operations, raising money also is a way of life at MinnPost. The good news is that MinnPost is making headway toward Kramer’s “stated goal” of breaking even on “basic operations” without foundation support by 2012. The bad news is that he is only about halfway there. Considering the dicey economic environment in which he launched the site, that’s respectable progress. But it also means Kramer has a way to go. MinnPost’s highly diversified revenue stream includes selling advertisements, soliciting sponsorships, collecting pledges from some 1,700 individuals, syndicating content, consulting and even organizing an annual gala called MinnRoast, where local dignitaries tonight will be spoofed before a 700-person audience put in the proper frame of mind by the aforementioned martinis. In 2008, the first full year of operation for MinnPost, the above activities raised $577,ooo, or 37.9%, of the organization’s $1.5 million operating budget. Last year, according to its annual report, MinnPost raised $675,000 in earned revenues, or 55.7% of an operating budget that was trimmed to $1.2 million in light of the expectation that income would be lower because of the recession. Thus, MinnPost moved in 2009 to the point that more than half of its operation was funded without support from institutions and large individual bequests. However, that still meant MinnPost had to dip into its modest $1.1 million nest egg to cover its budget shortfalls. If MinnPost can’t achieve philanthropic independence by 2012, it either will have to seek additional foundation funding, curtail operations or both. For the moment, however, Kramer’s plan seems to be on track. You’ve got to hope he makes it. If you want to know how newspapers got into the pickle they are in today, read the text of a remarkable 15-year-old speech just unearthed by Jim Fitzpatrick, a retired editor and relatively new entrant to the journo-blogosphere. The speech in question, which essentially writes off the Internet as anything for publishers to worry about, was given in May, 1994, in Kansas City by Arthur (Punch) Ochs Sulzberger, the chairman of the New York Times Co. and father of the company’s current chief executive, AOS Jr. In fairness to Mr. Sulzberger, lots of people were skeptical about the prospects for the Internet in 1994. So, it is fair to ask whether I was any more insightful at the time than Sulzberger. The answer is yes, sort of. At the time of this speech, I was the chief operating officer of a national cable company deciding on whether to spend hundreds of millions of dollars in capital projects to rewire our systems to upgrade channel capacity. Responding to the wise counsel of engineering wizards Ken Wright and David Large, I was persuaded to spend tens of millions of extra dollars to put thick, fiber-optic bundles into each project to equip them to carry what we then called “future data services.” We didn’t know enough to call it the Internet. But, thanks to Wright and Large, our newly rebuilt systems were ready when the web took off. I took off myself by the end of 1995, forsaking the cable business to join the first of three Internet start-ups in Silicon Valley where I served as CEO. Although I had no idea exactly how things would turn out, I had little doubt we were on to something revolutionary.Nothing has happened in the intervening years to change my mind. This column originally was published in the April edition of Editor & Publisher Magazine and is being reprinted with permission. To subscribe to the magazine so you can see the full array of industry coverage when it first appears in print, click here. The California Newspaper Publishers Association recently invited me to drive down the coast on a Saturday to give a free lecture on how to charge for news on the web. Despite the amusing irony of the request, I declined, because, like the publishers who want to sell their content, I think people should be compensated for their work. You are reading this, for example, because I was paid to write it. As long as some plausible source is willing to dispense news and information for free – as I am sure will be the case at the convention I won’t be attending – it is going to be awfully hard for a publisher to charge for substantially the same thing. This goes double, or triple, if the information is commoditized, as a great deal of newspaper fare happens to be. With so many sources of free information available online, newspapers simply can’t hope to charge for international, national, state and entertainment news. The same goes for sports scores and stock quotes. The only way most publishers can charge for online content is by investing in the creation of premium products and services that readers can’t find anywhere else. So far, I haven’t seen much evidence of that. :: Newsday-style pay wall. This requires site visitors to pay to read anything more than the first few lines of an article. The Long Island daily recently admitted it sold only 35 subscriptions at a $5 a week, but is happy with the program because the site is given away freely as a retention incentive to subscribers of its print product and the cable service owned by its parent, CableVision. This idea is known to be successful only if the publisher also owns the dominant cable system on an island. :: Arkansas Democrat-Gazette model. Unlike most publishers, the D-G never put its content on the web for free. 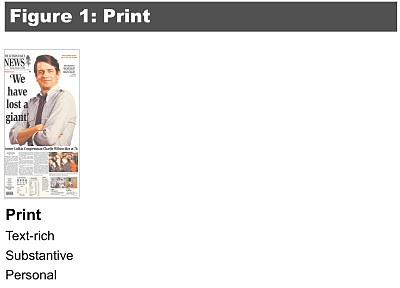 To see the website, you either have to subscribe to the print product or buy an online subscription. This has worked well in a comparatively isolated market with limited competition, where a foresighted publisher set the right expectations with readers. This plan will be hard to execute in places where readers have enjoyed 15 years of free content. It will be even harder to execute in competitive markets. :: New York Times-style metering. This system allows visitors a certain number of free views of a site before she is confronted with a demand to subscribe. While this has worked well for mission-critical business news in the Financial Times and might work for the mission-critical national news in the NYT, the utility of the system remains to be proven at a general-interest paper. It is also worth noting that certain competitors (including a major publication in the nation’s capital owned by a highly profitable test-prep service) are believed to be eager for NYT to turn on the meter so they can promote the fact that their stuff is still free. :: iTunes-style micropayments. This has been great for Apple and somewhat palliative for the struggling music industry, but it hasn’t been tried at any newspaper. Publishers should note that even the recording industry group charged with chasing music pirates admits that 10 songs are stolen for every one that is purchased. My guess is they are low-balling the number. :: Miami Herald-style tip jars. Two months after the paper feebly asked readers for voluntary online donations to defray the costs of gathering news, the paper sheepishly canned the idea. Enough said. Pick a system, any system. Or make up your own. It won’t matter what pay model publishers choose, unless they produce unique and compelling content, tools or applications that readers can’t find anywhere else. And they will have to learn how to market them better, too. The NYT, for example, has a terrific iPhone app that lets me read everything that is going into the next day’s paper before I go to bed at night. It looks good, works well and is easy to use. And it is free. Why? Instead of grappling with such tactical distractions as what type of pay wall to erect, publishers need to think strategically about how they are going migrate from operating increasingly indefensible, geographically defined monopolies to being serious players in an unruly and relentlessly competitive global market where no one – especially them – gets to be in charge. I hope the person who got my spot on the California panel mentioned this. The financial drain of defending himself against a libel suit forced journalist John L. Smith to file bankruptcy at the same time his 8-year-old daughter was diagnosed with a brain tumor. But he says his work was worth the personal cost. Reporter Diana Washington Valdez of the El Paso Times says she narrowly dodged arrest and kidnapping on multiple occasions as she reported on the deadly narcotics trade and the evident killing of women for sport at the Mexican border. But she says she won’t be intimidated. Omoyele Sowore, who operates a website called Sahara Reporters in New York that investigates government corruption and malfeasance in Nigeria, runs the risk of immediate arrest if he is caught sneaking into his home country to dig up more stories. But he says that won’t stop him from going back. They were among the journalists who bore witness at a remarkable panel this weekend to the personal courage it sometimes takes to deliver hard-core, hard-nosed investigative reporting. In so doing, they underscored the enduring importance of journalism. The journalists told their stories at the Fourth Annual David and Reva Logan Investigative Reporting Symposium at the University of California at Berkeley, which was organized by friend and colleague Lowell Bergman, a courageous investigator in his own right. The three journalists were joined on the panel by Dana Priest, a Pulitzer Prize-winning reporter for the Washington Post who was shunned by the intelligence community after revealing secret prisons operated by the Central Intelligence Agency, and Ari Berman, who is the target of a subpoena resulting from his work as a student at Northwestern University investigating the case of a man who may have been wrongfully convicted of murder. The moderator of the panel was Brian Ross, the top investigative reporter at ABC, who described how a two-minute segment on entertainer Wayne Newton led to nearly a decade of litigation. Although Newton initially won the case against Ross and NBC, where he worked at the time, the judgment was overturned on appeal. Fortunately for Priest, Berman and Wilson, they were associated with large, well-endowed institutions that were able to support and defend them when their work was challenged. But journalists working for smaller and less wealthy organizations – or on their own – put everything on the line. Many a hardened journalist choked up in the auditorium on Saturday afternoon as Smith, a long-time columnist for the Las Vegas Review-Journal, told how the subject of one of his books sued him at the same moment his daughter was diagnosed with a brain tumor. Smith said his daughter survived but now uses a wheelchair. The suit that forced Smith into bankruptcy, which was filed by one of the movers and shakers he has covered in two decades of poking into the secrets of The Strip, was the second he faced for books he wrote about some of the most powerful people in Las Vegas. While both suits eventually were dismissed, Smith was largely on his own to defend himself, because the cases did not result from his work at the newspaper. The nightmare of the second suit finally ended when a prominent lawyer took up the case for free – but not before Smith was forced to file for bankruptcy protection from his creditors. When Smith prevailed, he said, the plaintiff was ordered to pay his attorney – who racked up some $300,000 worth of hours – a mere $12,000 in duplicating fees. Washington Valdez and Sowore each said they run the risk of capture and harm if they turn up in the wrong place at the wrong time. Like Smith, all three agreed that the importance of their reporting outweighed any personal risks to them. So, they aim to keep asking tough customers tough questions. What courage. What commitment. What inspiration. Sure, newspapers are hard up, but exploiting bereaved families with exorbitantly priced death notices seems to be a distasteful and strategically inept way to try to make ends meet. I stumbled across the problem this week when I tried to buy a death notice in my local paper, the San Francisco Chronicle, which proposed charging $450 for the one-day run of a crappy-looking, 182-word death notice. Instead, I decided, with the consent of my friend’s widow, to donate the money to a college fund for their four children. But she and I remain appalled that the Chronicle would do this to families at the moment of their most exquisite grief. Chronicle management did not respond to a request for comment. Newspapers, like funeral directors, know they can charge whatever they want when someone dies, because it’s not a time that people are in a state of mind to hunt for bargains. In most communities, there is only one paper to choose from, so there is no other option, anyway. Newspapers selling high-priced death notices know that the several hundred dollars they charge will be mere rounding errors in the four- and sometimes five-figure bills generated by the average funeral. So, yes, they can get away with it. But that doesn’t make it right. This practice is not only exploitive, but also strategically tone deaf, because it misses a terrific opportunity to cement reader loyalty to a newspaper. Every country editor knows that names make news. Birth announcements, wedding announcements and death notices are the only ways most people ever get their names in the newspaper, an event that remains a big deal to all but the most jaded individuals. That’s why many small and medium papers across the country fill a disproportionate amount of their space with news of events that are milestones in the lives of common readers. But obits are popular in big cities, too. While metros can’t fill their shrinking news holes with every birth, wedding or funeral, they can offer people a free place on their websites to self-chronicle the comings and goings of their families. It wouldn’t take much space in the print product, either, to run a reference to the names of the people whose life milestones were recorded on their websites in the past 24 hours. And I’ll bet any number of advertisers would be happy to sponsor these high-traffic print and online listings. So everybody wins. The reader. The advertiser. The newspaper. And the community. Hyper-local content doesn’t get any hyper-er or local-er than that. 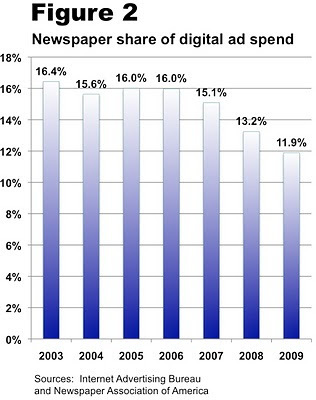 The newspaper industry is falling farther and farther behind in the life-or-or-death mission of shifting its revenue base from print to the interactive media. The Internet Advertising Bureau, a trade organization, provided total industry data here. The NAA’s newspaper data is here. Taken together, the two sales reports show just how short publishers are falling of their oft-stated goal of weaning their businesses away from print revenues. The goal is spot on, too, given that print advertising has plunged a staggering 43% since 2005 – a decline that many publishers fear may continue, albeit at a slower pace, for the foreseeable future. 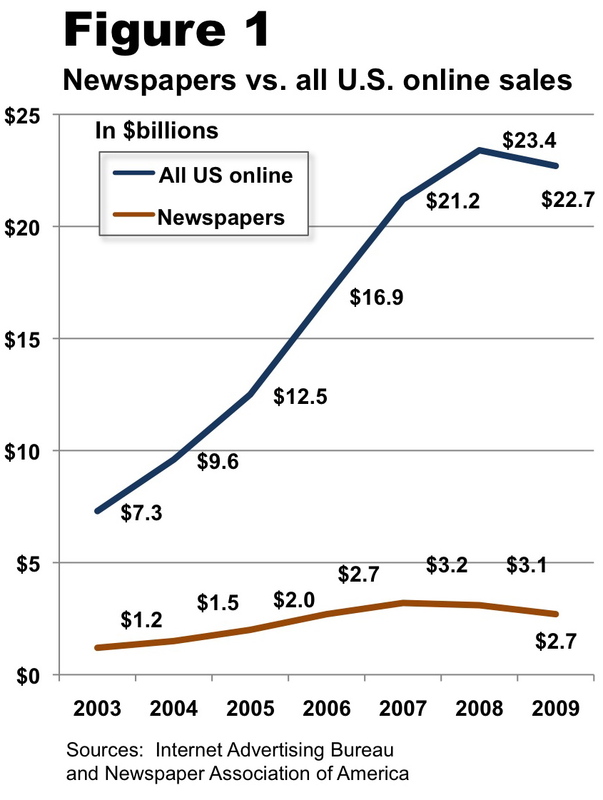 If print sales continue contracting and interactive sales don’t take up ever more of the slack, then newspaper companies at some point will run critically short of the revenues they need to remain healthy concerns. 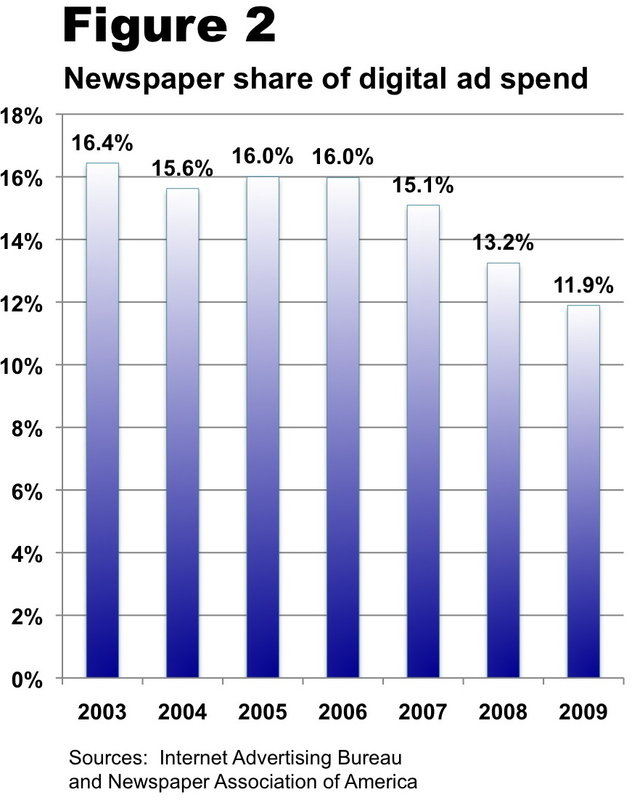 For all the digital-is-the-future rhetoric we have heard for years at newspaper industry conferences like the NAA hoedown under way this week in Orlando, interactive advertising averaged barely 10% of the anemic $28 billion in revenues reported by newspapers in 2009. Publishers first ignored the new media in hopes they would go away and then blew tens of millions on ill-conceived, technologically tin-eared, bureaucratically bloated and under-promoted projects that failed to come close to countless innovative efforts brought to market by such garage dwellers as Sergey Brin and Larry Page. 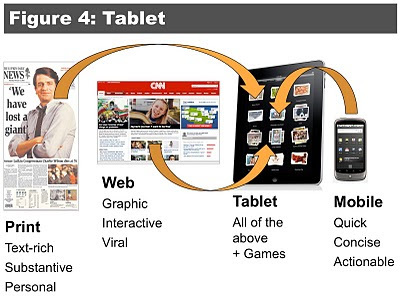 When newspaper advertising commenced the vertiginous slide that began the year after sales hit an all-time peak of $49.4 billion in 2005, publishers were so preoccupied with fixing the core business that they spared comparatively scant resources for interactive ventures. Even when they gamely dabbled in the new media, they scarcely knew what to make of such alien concepts as tweeting, social networking, GPS advertising and augmented reality. When the Internet arrived in the mid-1990s, most publishers quickly put their expensive-to-produce print content on their websites for free in the expectation that an ever-growing number of page views would yield ever-higher ad revenues. 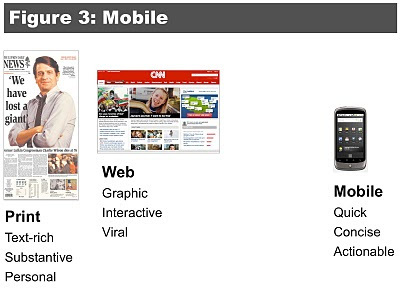 But a glut of page views across the web since then has driven ad rates to ever-lower levels, instead. After 1½ decades of giving away content for free, profit-challenged publishers today have started thinking they can charge for it – a hope called into question last week when the Valley Morning Star in Harlingen, TX, dismantled a months-old pay wall after its traffic collapsed by some 40%. Because content has been free at most newspapers since the inception of the Net, publishers declined to invest in any of the numerous technologies that would have enabled them to protect their most valuable resource from unauthorized use. Today, publishers are deploying a global whack-a-mole service in an endless, likely fruitless effort to crack down on copyright poachers. Instead of building innovative, transactional ad products to satisfy the desire of marketers to reach targeted and verifiable prospects, publishers tried to migrate their existing print advertisers to the web, selling banners to retail and national advertisers and online listings to such traditional classified customers as employers, auto dealers and real estate agents. When the print business collapsed, publishers lost not only their print revenues but also much of their online volume, too. Classified advertisers, in particular, migrated to free or cheap websites that specialized in recruitment, autos and real estate – and a great many of them are not likely to return when the economy picks up again. Classified advertising matters, because, until it collapsed, it produced as much as two-thirds of the revenues at some newspaper websites. With 90% of their revenues coming from print, publishers focused first and foremost on preserving that business. The Boston Globe famously declined to invest $1 million for a stake in the infant Monster.Com in 1995 because its owners feared a cut-rate recruitment site would threaten their continuing ability to gross $100 million a year by charging hundreds of dollars for a three-line, agate ad. The preoccupation with protecting print – plus a not-incidental amount of inertia – prevented most newspaper executives from recognizing the profound shifts in technology, consumer behavior and media economics that were destined to rock their world. Given that there is no shortage of intelligence and talent at America’s newspapers, the only explanation for the industry’s failure to embrace the new paradigm is that it really did not want to change. Now that a growing number of newspaper people truly and deeply recognize publishing companies must adapt or die, the burning question is whether the industry has the time, skill and resources to turn things around. The protections customarily afforded the press typically don’t exist for the citizen journalists supposed to fill the gap created by the contraction of the mainstream media. Reason No. 1 is that our democracy benefits from the scrutiny of a vigorous and unfettered press. That, in and of itself, is well worth championing. Reason No. 2 is rooted in pure self-interest: A decline in the protection of one class of journalists could lead to a decline to the protection of all journalists. While the modern digital media make it incredibly easy for anyone to try his hand at journalism, bloggers, freelance photographers, Huffington Post contributors and individuals who write for citizen-generated news ventures operate at a distinct disadvantage to journalists employed by recognized news organizations. The most obvious disadvantage is that self-appointed journalists work for something between a pittance and nothing. But they also lack three things that make life easier for journalists working for a recognized news organization: Libel protection, press credentials and shield laws that prohibit prosecutors from tossing reporters into jail until they reveal confidential sources of information. Although citizen journalists seldom think about the triple threats they face, they actually run major financial and legal risks. Independent journalists court financial ruin by not carrying libel insurance that would provide them with legal protection in the event they were sued for libel – and would help pay the damages if they happened to lose. Most citizen journalists are so strapped that they wouldn’t even think about shopping for libel insurance. If they did, they would learn that $1 million of libel coverage from a major national carrier would cost between $2,000 and $3,000 per year, with the journalist being obliged to pay a $10,000 deductible before any insurance coverage kicked in. A company called Publiability.Com offers the same amount of coverage for under $1,000 annually, with a $5,000 deductible. In all cases, insurance rates depend on the subjects you cover, whether you make money on your site and several other factors. Because insurance underwriters look closely at the work of each individual applicant for libel insurance, not everyone who is willing to pay is offered coverage. The other two problems – lack of press credentials and lack of shield protection – stare me in the face every week in my class at the Graduate School of Journalism at the University of California at Berkeley. For want of a press pass, one of my students, Jake Schoneker, was arrested last month when he was covering a group of demonstrators who blocked a freeway while protesting tuition increases at the university. Because student and citizen journalists in these parts can’t get official press cards from the Highway Patrol or local police agencies, “the only press credentials I had to offer were a business card and a student ID,” wrote Schoneker, who spent a night trying to sleep next to a communal toilet in a filthy jail cell. The reminder of the third peril to independent journalists is Josh Wolf, a student who spent a record 226 days in federal prison for refusing to give un-aired videotapes to a determined prosecutor. Had Wolf been hauled into a California court instead of a federal tribunal, he could have argued that the state’s press shield law protected him from having to turn over his unpublished product to prosecutors. But there is no federal shield law and no such laws exist in 14 of the 50 states (list here). Even if Wolf’s case had come before a court in many of the states that do have shield laws, a prosecutor might have argued that the law did not apply to the independent journalist because he was not an employee of a recognized news organization. In fact, the issue of determining who qualifies as a journalist is the primary factor holding up passage of a long-sought and long-overdue federal shield law for reporters. Although the House last year passed one version of a federal shield law and a Senate committee approved a similar measure shortly before Christmas, action on the bill has been blocked by two senators who want to narrowly construe who is considered to be a journalist. Senators Richard J. Durbin (D-IL) and Dianne Feinstein (D-CA) are holding up the vote because they want the bill to cover only individuals who have demonstrated some sort of “track record” as a journalist, said Lucy Dalglish, the executive director of the Reporters Committee for the Freedom Press, one of more than 80 organizations pushing for passage of a federal shield law. Because Durbin and Feinstein have not spelled out the standards they are seeking, it is not clear whether a person claiming protection as an independent journalist will be required to demonstrate some sort of previous professional background, a prior body of work or evidence of formerly having being paid for her efforts. Would I qualify as a journalist in the eyes of the new law? Would you? At this writing, there is no way of knowing. Put all the risks together, and it’s pretty scary to be an independent journalist. If everyone understood the danger, how many people would do it? This column originally was published in the March edition of Editor & Publisher Magazine and is being reprinted with permission. To subscribe to the magazine so you can see the full array of industry coverage when it first appears in print, click here. There’s a succulent advertising stream that could replace a substantial portion of the $17 billion in sales the U.S. newspaper industry has shed since 2007. Anyone interested? The opportunity is called Yellow Pages advertising and there are powerful reasons to believe that a growing proportion of the directory industry’s business will be up for grabs in the near future as consumers increasingly choose to let their fingers do the walking on the web. Although newspaper publishers are in the best position to bag a substantial share of the $16.5 billion now spent annually on directory advertising, they will not be alone in the hunt. A little outfit called Google recently zeroed in on the business by starting to sell upgraded search listings to local merchants. 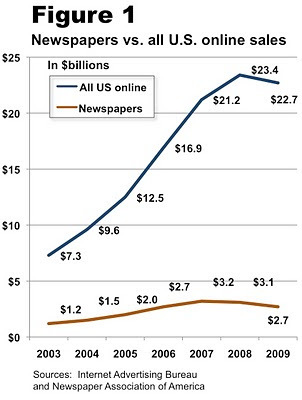 Because newspapers have sales forces that Google can only envy, however, this opportunity is theirs to lose. Some 85% of the Yellow Pages business, like the bulk of newspaper sales, is derived from print advertising. But there is growing evidence that the print YP business may begin to unravel as fast as a certain other print business that comes to mind. About 43% of the 18 billion web searches conducted in the typical month are for products and services that consumers intend to buy from bricks-and-mortar providers, according to a study conducted by the Kelsey Group, a market research company. That comes to 7.7 billion shopping searches per month. 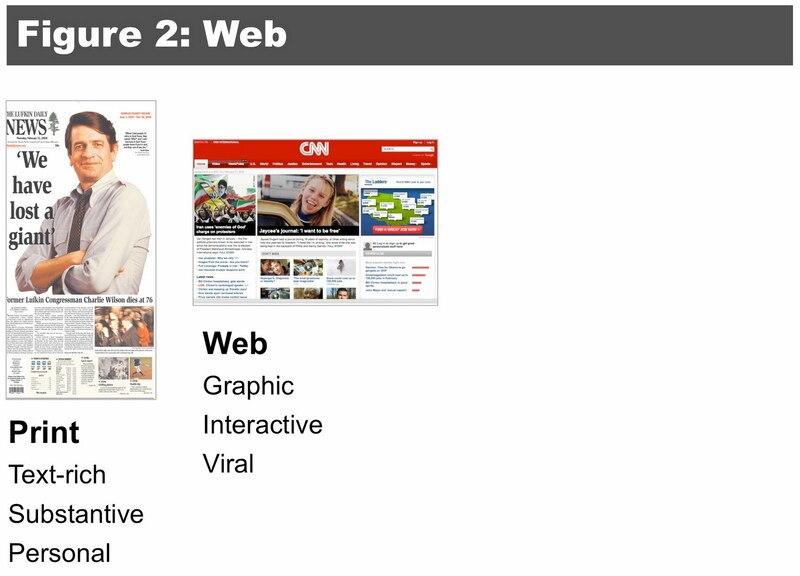 Kelsey also found that 53% of shoppers prefer searching the web to paging through printed directories. Young people don’t find the fat ad books to be environmentally acceptable. Older people, while also concerned about the environment, particularly hate squinting at type that seems to get smaller every year. 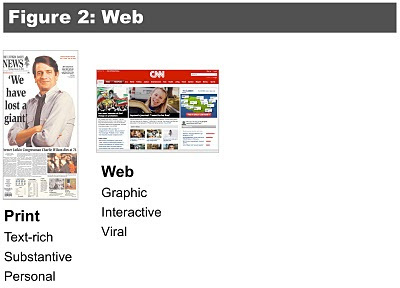 Taken together, the prevailing trends suggest a gloomy outlook for print directories. Although a majority of consumers already favor online searches for products and services, most merchants keep buying YP ads because – as many of them have told me in so many words – “that’s what you are supposed to do.” The source of this wisdom usually is a YP salesperson. Even most of the merchants who have built websites are wasting scandalous amounts of time and money on their online presence because they aren’t doing it effectively. That’s bad for them but great for astute newspaper publishers who can clue them in to the art and science of web marketing. Web marketing matters because Google and the other search engines don’t care about the splashy graphics or clever copy that people fuss over when they build a site. The search engines only pay attention to the boring computer code you see when you click the “Page Source” tab on a web browser. A fair number of the people who build websites – including folks at some newspapers – don’t know how to optimize the construction of a site so it gets included in the top results on Google. Poor search-engine optimization – or SEO, as the skill is called – results in an inferior position on Google. Since 95% of consumers never look past the first page of search listings, a business that doesn’t make the front page on Google is seriously out of luck. Build an online business directory. Using readily acquirable business listings, create an attractive page where site visitors can search for businesses, map their locations and submit reviews of the companies. In addition to selling display advertising, sell upgrades to your free basic listings. Offer site-building and hosting services. Working with in-house talent or widely available third-party resources, manage the construction and operation of sites for local merchants. This not only unlocks a new, recurring revenue stream but also creates a long-term collaborative relationship where you’re seen as a trusted partner, not just another money-grubbing vendor. Provide SEO and SEM services. SEO refers to the maintenance (discussed above) that is required to assure a site readily gains high rank in a Google search. Because SEO is an ongoing process requiring regular attention, this creates another recurring revenue stream. SEM stands for Search Engine Marketing, which involves buying and monitoring the performance of keyword ads on Google and other sites. It, too, represents an ongoing revenue opportunity. You can build these capabilities in your own organization or partner with any number of outside firms. Final advice: Don’t delay. This is a strategic slam-dunk.